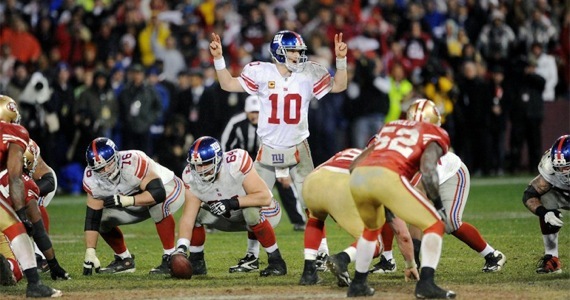 Sunday night, the New York Football Giants punched their tickets to Super Bowl XLVII in Indianapolis. Yes, the 2011 New York Giants. The same Giants that lost to the Washington Redskins in week 14 to fall to 7-7. Just five weeks later, they’re on their way to Indianapolis to play for the world championship against some guy named Brady (just kidding, all due respect to the Pats for their win against the Ravens), and they had to go through the San Francisco 49ers to get there. I watched the NFC Championship game at my house with my good buddy, Dr. Draft, who is a big time Giants fan as well, and I can tell you that this game was a tough one for us to sit through at times. The weather made for awful conditions for both teams, and the offenses really weren’t able to get much going on either side (save for Vernon Davis). It was a defensive battle that you just got the feeling would ultimately be decided by one team making a huge mistake, and boy was it ever. In this game, however there were lots of mistakes. 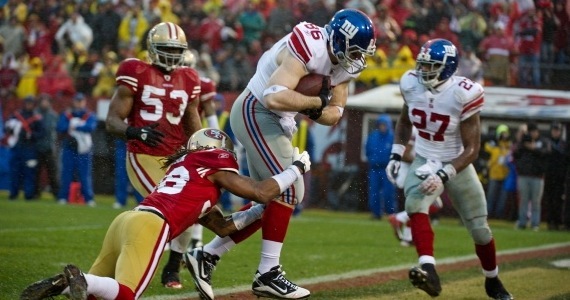 Both of the 49ers TDs came off of huge coverage mistakes by the Giants. On the first one, Antrell Rolle basically let Davis get by him thinking that he’d have no trouble catching up to the big tight end. Huge mistake. Next thing we knew, Davis was sprinting all alone towards the end zone and the 49ers were up 7-0. After Manning threw a touchdown pass to Bear Pascoe (how can you not love a guy named Bear?) with 11:15 left in the half, Lawrence Tynes kicked a field goal to put the Giants up 10-7, which was the score at half-time. Pascoe Barrels into the end zone on his 6-yard TD catch. With 5:18 to go in the third, AlexSmith found Vernon Davis again, this time on blown coverage by Kenny Phillips, who left Davis wide open near the corner of the end zone. The 49ers led 14-10. That’s when the 49ers took their turn at making costly mistakes. After holding the Giants to yet another punt (Weatherford punted twelve times in all for the G-Men), 49ers wide receiver/punt returner Kyle Williams started his nightmare night. Seeing that he had no chance to return the punt, Williams decided to let it bounce so that the Giants could down it. Instead, the ball bounced, hit his leg, and was picked up by the Giants Devin Thomas, who was hustling to down the ball. The play was originally ruled incorrectly as a downed punt, but Tom Coughlin challenged the ruling and won, and it was Giants ball. A few plays later, on 3rd and 15 and with 8:34 to go in the game, Eli found Mario Manningham in the middle of the end zone to give the Giants a 17-14 lead. The Giants defense, not to be outdone, committed several penalties, including a personal foul and a 3rd down illegal contact penalty which let the 49ers march down the field and kick a field goal to knot the game at 17, which eventually sent everyone to overtime. After the Giants offense sputtered and the 49ers did too, the Giants got the ball back and were forced into a punting situation again. Kyle Williams (by the way he’s the son of White Sox GM Kenny Williams, an idiot in his own right), not to be out-shined by what Lee Evans and Billy Cundiff did in the AFC Championship game, fielded the punt and started to run it back. Devin Thomas, one of the game’s heroes, jumps all over Kyle Williams overtime fumble. I know you’re probably thinking… Jobu… stop it. Do not tell me Son of Kenny fumbled another punt, because there’s no way you’d be telling the truth… just stop it. Sorry folks, to Jim Harbaugh’s chagrin (there was so much chagrin from him on this night), Williams got hit by Giants special teamer Jacquian Williams, coughed the ball up and it was recovered by who? None other than Devin Thomas! 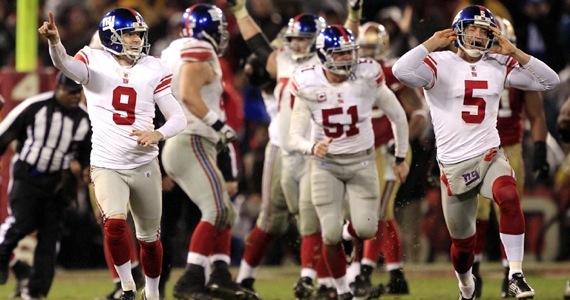 Four running plays later, Lawrence Tynes further carved out his spot in Giants kicking history by hitting his second career game-winning, overtime field goal on the road, in awful weather, in the NFC Championship (here’s the first one… remember when Brett Favre gave that game away?). Steve Weatherford yelled obscenities that were clearly captured by FOX cameras, and the Giants were on their way to Indy. It certainly wasn’t the prettiest win of all time, but they don’t have to be pretty. They just have to go on the left side (thanks Michael Kay). To be honest, I never really felt the Giants were going to lose. The way the Giants played in the four games leading up to Sunday night made me feel like they could beat whoever they wanted to if they caught some breaks, and they did. Super Bowl teams take advantage of the favorable bounces, and the Giants have been doing that the entire post-season. Football is a team game, and lot’s of people had a hand in this win by the G-men. Throwing 58 passes is not an easy thing to do in an NFL game. Throwing 58 passes in such horrible weather, against a defense that hit him 20 times (including six sacks), is damn near impossible. Eli kept getting hit and he kept getting back up. Like every Super Bowl QB (and Eli himself especially) Eli had some luck help him out too. Twice the 49ers dropped potential interceptions because two defenders knocked into each other (one of them resulted in a pretty nasty collision and injury). No matter how you slice it though, Eli was a huge reason the Giants won the game. He didn’t give up, he stayed calm and collected in the pocket, even when it was collapsing around him, and he found a way to take advantage of mistakes and put up points. Cruz came literally out of nowhere this year to set the Giants single season receiving yards record (we covered him here) and, after a quiet first couple of rounds, basically carried the offense in the first half (until the 49ers decided to cover him), and ended up with 10 catches for 142 yards. Talk about Johnny on the Spot! Thomas’ hustle on special teams allowed him to recover the two fumbles that really gave the Giants this victory. The Giants scored their last ten points off of Thomas’ heads up play, and so he deserves to be called a hero (honorable mention to Jacquan Williams for that forced fumble in the OT). If not for two coverage breakdowns, The Giants might only have allowed three points Sunday night (also, Vernon Davis was out of bounds on his 73-yarder). While they had some trouble with Frank Gore (16 carries, 74 yards) and Kendal Hunter (4 carries, 31 yards), they completely shut down Alex Smith (except for the aforementioned Davis plays) and the San Francisco receivers. Michael Crabtree caught one pass for 3 yards late in the 4th quarter, and that was the only reception by a 49ers wide receiver in the entire game. Overall, Smith was 12-26 for 196 yards, completeing six passes to Frank Gore, two to Delanie Walker and three to Vernon Davis. In most games, if you can hold a QB to twelve completions and only one to a wide out, you’re probably going to win, and the Giants did. We talked about this before, but Williams’ mistakes were so costly that I had to mention them again. He muffed one punt and fumbled another, setting up 10 points for the Giants, including the game-winning field goal by Tynes in OT. 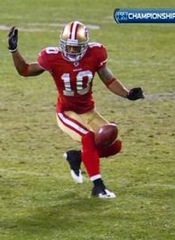 One interesting note is that Williams is not the 49ers normal punt returner. Their specialist, Teddy Ginn, Jr. normally handles that role, but he was out with an injury. Tough one for Williams. I mean, does anybody feel worse than this guy right now? He basically single-handedly cost his team a Super Bowl berth. Was he not satisfied with the first punt he totally screwed up? Now rumors are spreading that the Giants may have targeted Williams based on his history of concussions, or that he was playing with an injured shoulder, but the bottom line is he blew the game. He certainly doesn’t deserve the death threats he’s allegedly been receiving via twitter, but you know what they say about excuses and how they compare to a certain part of the human anatomy (hint: everybody has one). At least he’s not the one using the excuses (someone else leaked them), so he’s still probably more popular than his terribly annoying father. Look, I’m not going to sit here and tell you I never got nervous about this game, or that my confidence never even waivered at all. but these Giants are finding ways to win games. At the end of the day, they ended up winners, just like they did against the Falcons and the Packers. They went on the road again and avenged another regular season loss. There’s an eerie 2007 feeling around this team, so it’s appropriate that they get to face Tom Brady and the Patriots in the Super Bowl again. I won’t make my prediction yet, we’ll be saving that for the Friday before the big game, but it should be an intense and exciting matchup. It’s New York vs Boston, Eli vs Brady, Coughlin vs Belichick… it’s Giants against Patriots in the game to decide them all, and I can’t wait to watch it all go down.